In the early 1900s, Fernand Journeau emerged as one of France’s preeminent hoteliers. To capitalize upon his success, he decided to develop a hotel in the rustic, seaside municipality of Biarritz. Christening it Le Régina Biarritz, Journeau eagerly debuted his new establishment in the summer of 1907. The popularity of Le Régina Biarritz soared, with the building forming a prestigious reputation for opulence and luxury. Its early prosperity was not destined to last, however, as the effects of war and financial hardship took their toll during the 1930s and 1940s. However, new ownership arrived shortly thereafter, and they invested heavily into renovating the building. By the mid-20th century, Le Régina Biarritz was once more a premier tourist destination. Many international celebrities and dignitaries continued to reside at the location, including King Hassan II of Morocco. The 65 lovely guestrooms and suites inside Le Régina Biarritz Hôtel & Spa - MGallery by Sofitel feature luxurious amenities like premium bedding, high-definition television, and a minibar with complimentary water. The opulent suites offer fabulous décor and comfortable living quarters. Nestled between the oceanfront terrace and the central patio is IQORI, Le Régina Biarritz’s elegant restaurant. Guests will feel at ease while dining at IQORI, as the restaurant emits an intimate ambiance. The restaurant’s Head Chef, Antoine Chaurd, conjures the very essence of southwestern France with his cuisine. Relying upon local flavors, Chef Chaurd crafts gourmet meals that enliven the soul. The Spa By Sothys at Le Régina Biarritz casts a tranquil atmosphere in which to unwind. Guests can treat themselves to a variety of treatments that uplift the spirit. Le Régina Biarritz’s also has three modern meeting venues that are perfect for hosting any business event. Hosts are certain to amaze their colleagues with the beautiful furnishings that decorate each space. From the hotel, guests can saunter into the charming community of Biarritz for a truly memorable experience. Biarritz features some of the most majestic beaches in all of Europe, with the Grande Plage and Plage du Miramar attracting thousands of people every year. Many restaurants and cafés line the town’s quaint streets, exposing visitors to the enticing flavors of the region. Biarritz provides numerous cultural attractions to visit, including the Musée de la Mer, an aquarium housed inside a 1933 Art Deco building. And guests will be drawn to the numerous historical structures scattered throughout the town, such as the churches of Chapelle Impériale and Eglise Alexandre Newsky. Beyond Biarritz, the rolling hills of the French Basque Country offer even more destinations to see. Once the realm of several mighty kingdoms, the area features countless locations that have borne witness to centuries of European history. Guests can tour one of the region’s many ancient villages to learn more about the Basque Country’s amazing heritage. 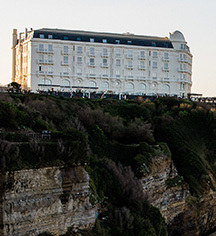 Le Régina Biarritz’s distinctive location in southwestern France places it perfectly for guests to fully immerse themselves into the area’s unique culture. 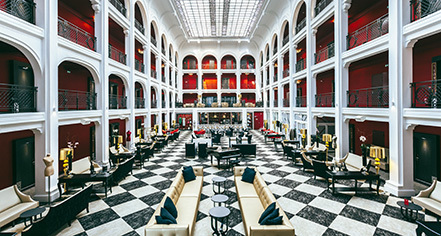 Le Régina Biarritz Hôtel & Spa - MGallery by Sofitel, a member of Historic Hotels Worldwide since 2018, dates back to 1907. During World War I, Le Régina Biarritz served as a French military hospital. Toward the end of the conflict, it also signed a deal with the American Red Cross to also act as a convalescence home for wounded soldiers. Cancellation Policy: Cancellation policy can vary based on rate. Early Check-In/Late Check-Out: Dependent upon availability. Extra Person Fees: €40 per person. Occupancy Restrictions: Three (3) per classic room, four (4) per suite. Parking: On-site self-parking is available on a complimentary basis. Pet Policy: €30 cleaning fee per day. Rollaways: Available upon request; one (1) per room. Learn more about the History of Le Régina Biarritz Hôtel & Spa - MGallery by Sofitel .